Come and Sing Mozart Requiem with Paul Spicer. 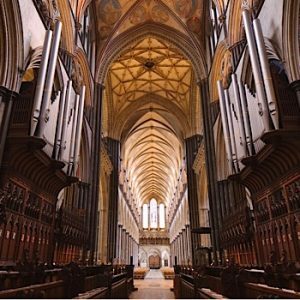 Music by Gowers, Harris, Fauré and more. Music by Ireland, Bruce-Payne, Cocker & more. 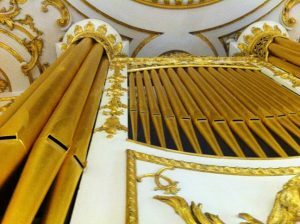 Organ Fireworks by Handel, Dupré, Vierne and more! 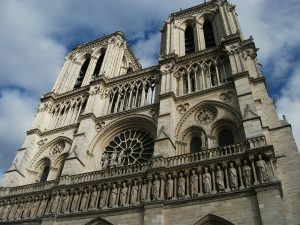 Music by Handel, Bach, Vierne, Mozart and more. 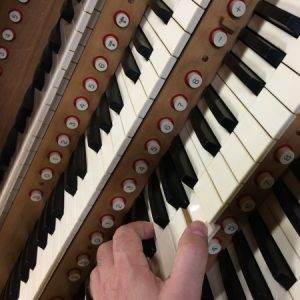 The 2017 season of Sunday Afternoon Organ Music concludes during the Christmas Tree Festival. St James’ Church, Eve Hill, The Parade. 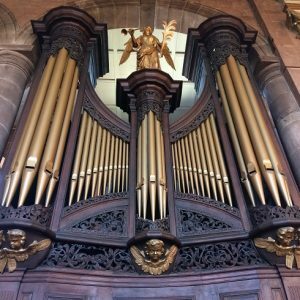 Sunday Afternoon Organ Music 2018 begins with virtuosic French works alongside Bach, Peeters and Rawsthorne. 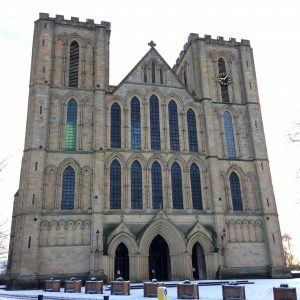 Music by Gigout, Bach, Guilmant, Dupré, Harris & Whitlock performed on the sizzling sounds of Blackburn Cathedral’s fine Walker Organ. An all-French programme full of both beauty and fireworks! 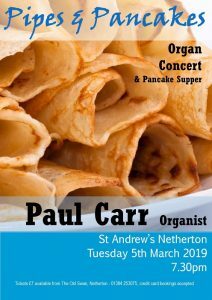 Paul Carr returns once again to play the annual Pipes & Pancakes concert. 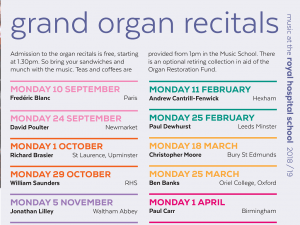 This year's programme includes Bach's Toccata and Fugue in D minor, Widor's Toccata and other well-known organ works. 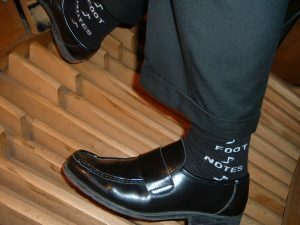 Paul Carr plays a programme of music by J.S. Bach including the famous Toccata and Fugue in D minor. 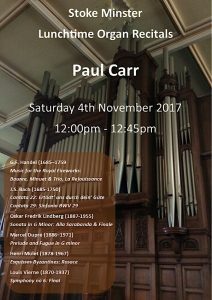 Come and hear Organist Paul Carr play works by Brewer, Bach, Massey, Whitlock & Dupré on Redcliffe's fine Harrison & Harrison organ. 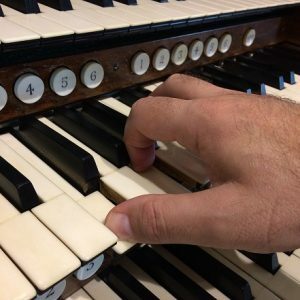 Paul Carr plays Bach, Beethoven, Mozart and more on the delightful Harrison & Harrison organ. 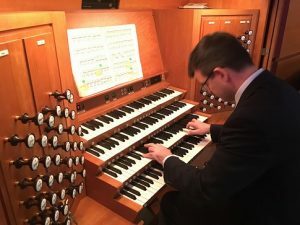 Easter Day: Paul Carr plays his 175th programme in the Sunday Afternoon Organ Music series. 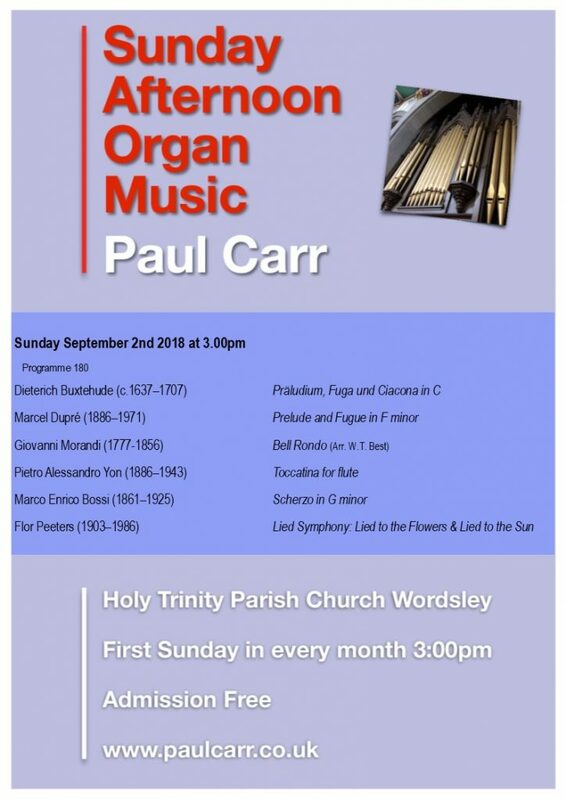 Paul Carr performs works by Mendelssohn, Bach, Nevin, Walton and his organ teacher Roy Massey. 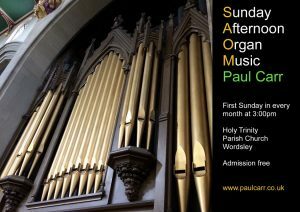 Paul plays works by Matthias, Mendelssohn, Holst, Widor and more! 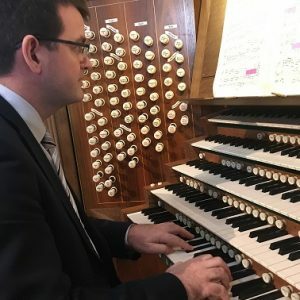 Paul returns to Cardiff to play the fine Father Willis organ at St John's. ...an eclectic selection of Italian choral music spanning 4 centuries. 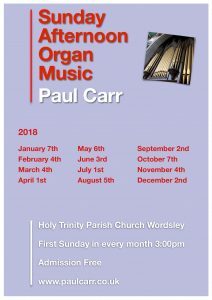 Paul Carr’s 8th visit to play the Nicholson Organ at Christchurch Priory. Paul's first visit to perform in the historic market town of Whitchurch in North Shropshire. 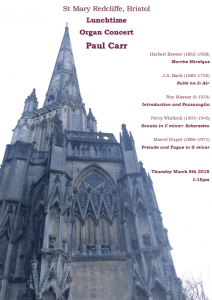 Following the success of his 2015 recital, Paul Carr returns to St Laurence Ludlow as part of Ludlow Arts Classical performing works by Bach, Mozart, Vierne and more. 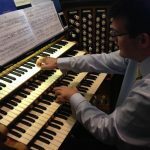 Paul returns to play the fine Harrison and Harrison rebuild of the Norman & Beard organ. Paul Carr performs in the Music for Reflection Series at Lichfield Cathedral. Also part of the Imagine Peace season of services and events throughout 2018 to commemorate the centenary of the 1918 Armistice. Bach, Handel, Schumann, Stanley, Mulet and Parry feature in this month's programme. 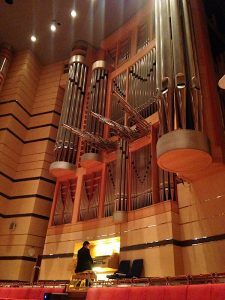 A free 40-minute organ recital on the 40-stop Walker organ in St Chad's Metropolitan Cathedral, Birmingham. Paul Carr plays Bach, Mendelssohn and Stravinsky. Paul's first visit to the magnificent 1930s Chapel, seating well over 1300, with an impressive eight second acoustic and its legendary Grand Organ, a 4-manual Romantic instrument of unrivalled power. Programme includes Toccata, Adagio & Fugue in C and Trio Sonata no 4 in E minor.